Tip: Keep your windshield scratch free. Acrylic Windshields are Breakable but made of a ‘hard’ materiel. Polycarbonate Windshields are ‘unbreakable’ but made of softer resins. Both Windshields will scratch. Oddly enough, the Poly windshield will scratch easier because itis made of softer materials. NEVER use Windex &/or paper towels! ALWAYS use a very soft cloth (diaper) and plenty of warm water & soap. A little automatic dishwashing soap will cause the water to sheet and avoid spotting. ALWAYS blot dry with a soft cloth. If the windshield is scratched but not badly, you can remove those scratches with our Windshield Polish & Cleaner and, of course, some elbow grease. If things have gone too far, just bite the bullet and get a new windshield. 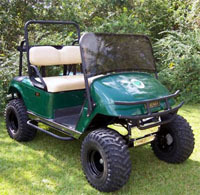 Golf Car Catalog has got you covered if you need a replacement. This entry was posted in Maintenance Tips by Michael Williams. Bookmark the permalink.